We had a customer that had an interesting request. They wanted to add water from the ocean to a saltwater pool. They wanted to do it when the tide was just right and from at least a foot below the surface so they didn’t get the surface debris. The standard method of accomplishing this task is to drop a float switch down into the ocean and when the tide rises the float turns a pump on. A number of issues come up with that design. Saltwater and float switches don’t work well together or at least not for an extended period of time. Placing a float switch a great distance away from the pump and away from the actual pool can cause damage from the environment because it is hard to protect the switch or have theft problems. 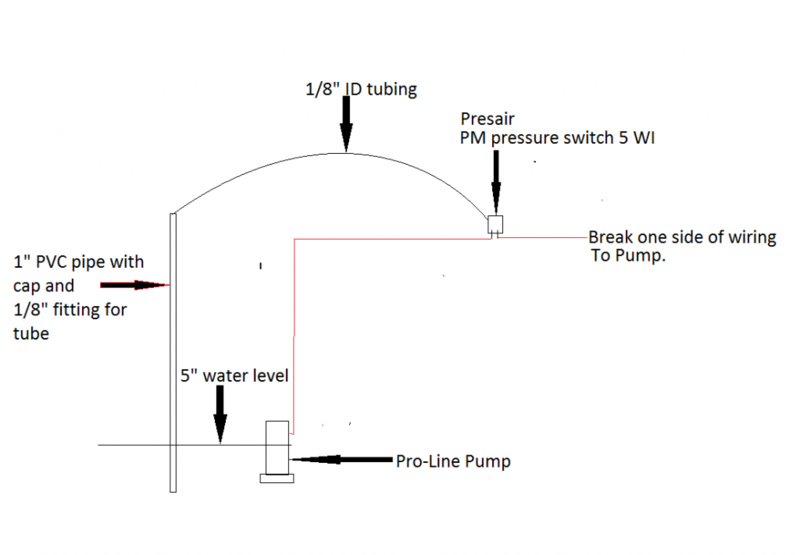 The float and switch either ends up submerged for a period of time as the tide rises or has to have a great deal of movement in the actuator to keep the switch out of the fluid..
An alternate design uses a basic pressure switch on the top end of a pipe that protrudes down into the ocean. A second pickup pipe is placed next to it. The pressure switch is set so that it will activate at the level of the tide that the customer wants and can be adjusted. The way it works is as the tide rises it increases the pressure in the pipe to our pressure set point. When this pressure is hit, a pump turns on and draws the fluid up the pipe until either a timer has been limited or until the tide goes down and relieves the pressure on the momentary contact pressure switch. It is easy to protect the switch on top, the only thing that goes into the saltwater is a pipe and the depth of the tide that the you want to set it at is adjustable. The best thing is that it works really well and the investment in the pressure switch in minimal. See the diagram below for more details.